Welcome to the NetCapper Store! Please feel free to browse our thoroughbred handicapping tools. Know what's winning in each race you face. Whether you're an in-depth handicapper or a lazy handicapper, The Capper is the tool for you. Know the minimum odds you'll accept. Wager using your favorite spot play. Technical analysis meets handicapping in the spot play charts. Get great trainer, jockey and pedigree stats. Includes the superior Cramer speed ratings and running style/position. 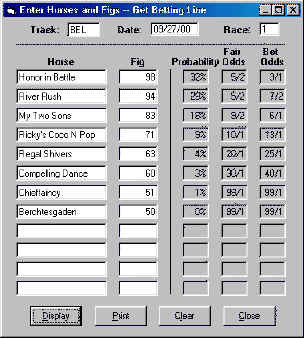 Input your figs, click a button, get a betting line for the race. 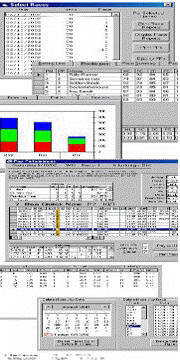 The FigLine mini-application was created to satisfy requests from a number of handicappers. They wanted a simple program that would allow them to put in their own figures, press a button, and get an accurate betting line. That's just what FigLine does. You can use this betting line to bet the race. The basic idea is: only bet a horse when its track odds are at least as high as its bet odds in the betting line. Most betting line handicappers will bet not only their first, but their second, third or fourth choices if they are offering attractive odds.